Just wanted you all to know, that the sport show is coming up starting today 3-2-04. Me, Tom Neustrom, Charlie Worrath, and Jeff (cubby) Skelly will be there to asnwer questions and take bookings for trips this summer. It is the first year we are at the sport show and we are looking forward to meeting lots of new people. So if you are out at the show look for the Northern Minnesota League Of Guides booth stop in and say hi. Just wondering what sport show you are talking about- like where is it happening at? The Northwest Sportshow runs today thru Sunday at the Mpls convention center. Lots of good stuff. Stop at the FishFever booth #730 and say hi. Jason I'll stop in. 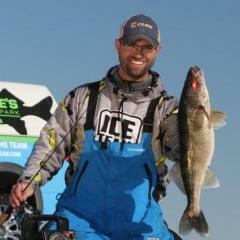 Thanks again for getting Ice Leaders Contestants on fish at Winni. I went to the Sport Show today with CrappieMagnet and I was impressed this year. The convention center was packed full with resorts, tackle, boats...everything and anything for fishing. I visted with Pete Riola at the FishFever.com booth, he had some awesome footage of a smallie trip showing, as well as some footage of the OVS in action. I also visited with Jason Boser and his clan too. So many things to look at there, so expect to spend some time (and money ). Dark Jr. and I will be down friday wandering around...gotta catch Uncle Al's little speech. It drives me crazy when they charge you $$ so you can come in and spend more $$ My wife and I will get to fork over a $20 bill to get in the door Sat. They all do it - Game Fair, the State Fair, etc, but some day I'd like to see people boycott these shows if the admission gets too high. I know that they're charging the exhibitors, isn't that enough? I agree with Blackjack, the price is getting ridiculous. I'd rather take the money, drive to Cabelas and buy some new tackle. It's fun watching the siminars and stuff, but I think someone is getting pretty rich off this deal, and it's not the resort owners or boat dealers. Do they have to pay the speakers huge amounts of money to come and talk or what??? Jason, Will Keep an eye pealed for ya! I remember a cold day on Winni a few months back when Jason led a bunch of us city folk and put us on fish. All day! For not one red cent! See you at the show! Jason is located in the 700 row. A nicer guy you will never meet. It might be a little on the spendy side but, they have to pay for the C.C. lease, pay the employees to keep the it clean. I went on tues. and spent $30, but I got lucky and found parking on the street. First time trip to the show, I was very impressed bought a few lures watched a few presentations, I thought the fish tank would be a little bigger. My god, there was the biggest crappie in that tank though. All in all it was a very good experience. Is there a FM booth there? Didn't grab a map just wandered around, just wondering as I might go back on sunday. Nope, no FM booth, but Jason Boser has a booth and so does Pete of FishFever.com, both are FM Pro Staff. There are also other FMer's that have booths and work at them. Stop by and say hi, I know they enjoy talking with fellow FMer's. Thank you all for stopping in at the booth and saying hi its good to see the people from fm around the state. next year we will have a banner of some sort with the fm logo on our booth I hope.